1) Use the photo(s) and prompt to write a story; all elements of the prompt must be a feature in the brief story you create. 2) Stay with the 500-word limit. 3) Craft and link your post by the following Tuesday. 4) When you have finished your post, link up your story using the inLinkz frog at the bottom of the prompt. 5) We were going to tell you to not take this too seriously, but reconsidered it because we know full well that asking writers to write something means that they will take it seriously. So, take it seriously, but don’t fret/panic/pass out/hyperventilate/lose sleep/run in fear over it. And don’t forget to link up here when you’re done! 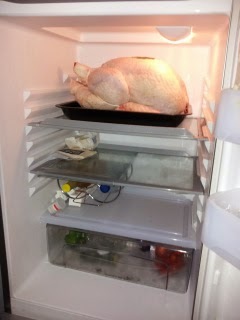 Lottie opened the fridge door and saw the turkey trussed and stuffed ready for the oven. She slammed the fridge door rattling the goods inside. How dare he do this to her? He knew how important this celebration was to her. He had the gall to say it was her fault. Ben always tried to make her feel guilty. He always made out she was to blame. Well she wasn't going to take it anymore. She grabbed her coat and bag, checked her keys and phone were in her pocket and flounced out of the house. Lottie turned left and followed the path to the junction, she stopped for a moment, the rush and noise of the traffic wasn’t doing anything to ease her frustration. She strode out purposefully the image of that stupid turkey still in her mind. She’d planned all the trimmings to go with it and now it would all be for nothing. Stomping along the footpath she was deep in thought as she arrived at the riverside walk, pausing for breath she stopped and looked across the vista at the still water. Lottie gazed at the reflections of the bare branches shining in the gentle ripples of the river. A lone man walked ahead of her. His stance was familiar. She couldn’t believe Ben was there as well. Not only had he accused her of all sorts of unfair things he was now walking in her favourite place. Lottie really had had enough of this guy. She fingered her mobile phone in her pocket as it vibrated against her hand. A quick glance showed the caller’s identity. She looked at Ben’s back in the distance and declined to answer. Lottie waited patiently, watching covertly, wondering what on earth he was up to. Ben put the phone back in his jacket. Lottie wasn't picking up his call. So she was sulking. That was about par for the course. He didn't know what else he could do. Jobs were so scarce these days that when his boss asked him to work on Mothering Sunday there was no way he could have refused. Lottie was just being unreasonable, totally unreasonable. He couldn’t get her to see that by keeping his job he was providing for her and the family. He paid the mortgage and the bills and gave her a generous amount for housekeeping. There was also enough to keep her in manicures, hair appointments, beauty treatments and everything else she did. What about those lunches she went on with her girlfriends? She didn't work. That book she says she is writing is only a pipe dream, if she is writing at all. She is just lazy. He would have to make her see he was only doing it for them. He didn't want to work this hard. He would love to stay home all day. 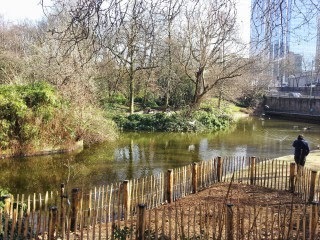 Ben gazed at the reflections of the bare branches shining in the gentle ripples of the river.